Canongate Books Limited, Edinburgh, Scotland, 2007, ISBN 978 1 84767 005 2. Time is a wonderful thing – it heals all wounds and some people even claim that it is able to fly… What’s more, it gradually changes the world around us, for better or for worse. One of the improvements time has brought us over the past decade is the availability of a large number of books about malt whisky. When I discovered single malt whisky in the early 1990’s, the internet didn’t exist yet. In the old days, one had to leave the comfort of one’s desktop to go hunt for whisky information in libraries and book stores. I suspect there must have been some good whisky books available in English at the time, but Dutch book stores usually only offered translations. If memory serves, the only whisky book that was widely available in Holland in the early 1990’s was Michael Jackson’s Whisky Companion. When I started exploring the world wide whisky web in 1995, that was the book that every whisky lover seemed to have on his shelves as well. 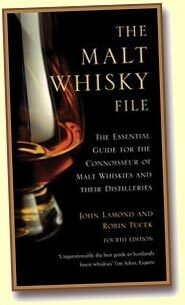 However, around that time I also heard rumours about another ‘indispensable’ whisky book called ‘The Malt Whisky File‘. I looked for it in book stores in Holland, but never found a copy. And then, by the end of the 1990’s, more and more other whisky books started appearing on the shelves in Holland while online stores like Amazon opened our eyes to a world of hundreds of whisky books in English. So, I sort of forgot about The Malt Whisky File until a few people pointed towards the publication in the recent row about the new SWA proposals. One of the writers, Blackadder’s Robin Tucek, pointed towards The Malt Whisky File (first published in 1989) for a perfectly simple definition of whisky types that didn’t require the introduction of the artificial phrase ‘blended malt‘ – a linguistic & logical abomination according to most maniacs. In the most recent ‘2008’ edition, the writers delve a lot deeper into this issue in the ‘File Notes’ section of the book. When the latest edition went to press, the SWA had already been pushing the ‘blended malt’ classification for a few years, but at the moment the classification hasn’t turned into law yet. The writers have taken the opportunity to take a closer look at the issue. That’s a very useful addition to the book – and the adjective ‘useful’ applies to the rest of the book as well. Just like Michael Jackson’s ‘Whisky Companion’, TMWF starts of with a few concise chapters about the basics; a guide to the regions (with a slightly different classification), the art of nosing, an overview of the major whisky conglomerate and independent bottlers, hints on pronunciation of distillery names, etc. 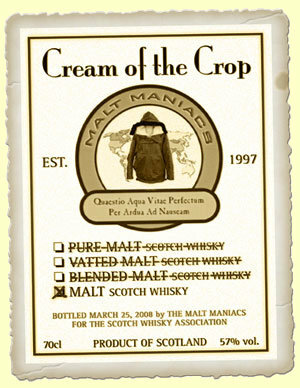 The ‘meat’ of TMWF is the central section with a description of all (malt) whisky distilleries in Scotland and Ireland. Here, the set-up is comparable with Michael Jackson’s ‘companion’ as well; a few paragraphs on the history of the distillery and tasting notes on one or more expressions. TMWF doesn’t contain scores like Michael Jackson’s ‘companion’ or Jim Murray’s ‘bible’; instead, for each whisky the writers indicate the sweetness and peatiness on a scale of 1-10. I think I would personally prefer overall scores on a 1-100 scale in the book, but I can imagine that the set-up they chose is useful for relative beginners. Because the writers of TMWF have usually sampled multiple expressions for each distillery, their approach seems more sensible to me that David Wishart’s, who seems to quantify the entire output of a distillery based on just one bottling in his ‘Whisky Classified‘. TMWF wraps up with a few small chapters about Japanese whisky, two Australian distilleries and a few whiskies from ‘the rest of the world’. It’s sort of a limp ending, because this section isn’t nearly comprehensive enough for my tastes. If I’m reading a chapter about Japanese whisky I’d like to think that it contains a fairly complete overview of the whiskies I could actually go out and buy. But of course that’s the problem with all whisky books that are (partly) based on tasting notes; none of them offer a complete overview of what’s currently available in a particular market. So, in that respect TMWF has the same ‘problem’ as Michael Jackson’s Malt Whisky Companion or even Jim Murray’s Whisky Bible. Since the invention of the internet, even the most complete books are outdated as soon as they’re published. Does that mean you shouldn’t buy TMWF – or other whisky books for that matter? No, most definitely not – especially if you’re a relative novice in the world of single malts. With a cover price of 12,99 GBP, it will cost you less than a bottle of malt whisky – and it should help you pick your future purchases more wisely. Even if you already own Michael Jackson’s Whisky Companion, it’s always good to be able to compare different opinions. And if you also add the Malt Whisky Yearbook 2008 to your shopping basket you’ll always have access to most of the information you need during a dramming session or shopping spree. Many of the ‘proposals’ of the SWA actually seem to make sense, but after some people from within and outside the industry tried to get a debate going about one of those proposals we gained some disturbing insights in the inner workings of the SWA. The proposed legal definitions of various whisky categories seem to have been ‘pre-cooked’ by a mysterious ‘working group’ of corporate representatives within the SWA. Various sources have informed us that it is virtually impossible for smaller companies to join these ‘working groups’. So, the policies of the SWA in this matter are actually the policies of ‘Big Whisky’ – Diageo, Pernod Ricard, William Grant, etcetera. Far enough, but that means that the SWA’s claim that they represent the entire Scotch whisky industry has to be taken with a few grains of salt.